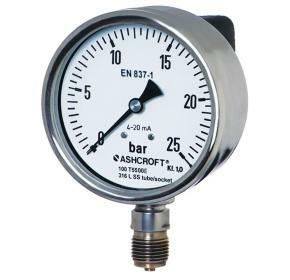 The Ashcroft® T5500E process gauge with output combines a pressure gauge and pressure transmitter; reducing costs for multiple instruments. This model can be integrated into safety and data acquisition systems or hazardous applications. An ideal product when pressure measurement needs to be monitored or controlled.